There are several new exhibitions at Hoy Kirk over the summer months. EXHIBITION ON NOW: We have kicked off the season of exhibitions with a display by local pupils from North Walls Community School. They have been working with Amy Kinsey on a wooly project looking at the heritage of sheep wool in Hoy. Amy’s idea was sparked off by looking at the census records and seeing the once popular occupation of ‘stocking knitter’. The result of the pupils research is a lovely exhibition of hand dyed wool, knitting samples and an enormous wall drawing almost half the length of the kirk! We also have some short exhibitions running at Hoy Kirk. This weekend (21-23 June) in conjunction with the Stromness Baptist Hoy weekend, recent graduate Jennifer McKinlay is showing a series of oil paintings ‘The Father’s Hands’. From 2nd July to 7th July we are delighted to be showing the work of visiting Bristol-based artist Sue Mara inspired by Rackwick. Sue said in this week’s Orcadian newspaper, ‘I spent many happy days pottering on the beach, or idling on the paths and hills, absorbed by the water and the sounds and the colours and the wind, and finding images I liked in pools, rocks, landscape and croft ruins.’ The exhibition Of Time and Tide comprises around 18 of Sue’s photographs and poems. 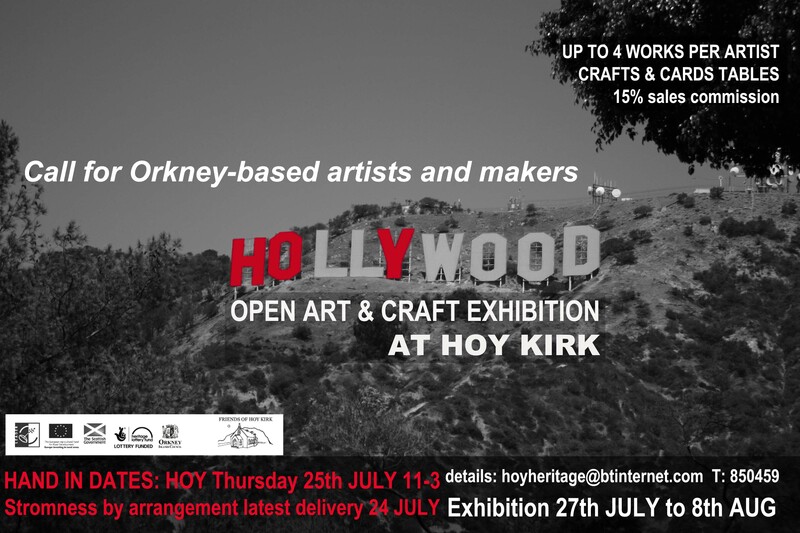 Call for artists: After last year’s success we are again running the Hoy Open Art & Craft Exhibition. The show is open to all Orkney-based artists and makers. Hand-in date for Hoy is Thursday 25 July & for Stromness it is 24 July. Up to four works per artist. We will have tables for crafts and we will also have a greeting card table, so please submit as many cards as you can! In the first instance register your interest here or call on 850459, and you will be sent further info. The exhibition will open on Hoy Show day Saturday 27 July and run to Thursday 8 August. ORCA (Orkney Research Centre for Archaeology) will be holding an exhibition at Hoy Kirk of recent archaeological surveys on Hoy. Archaeologist Dan Lee has been running community archaeology days and he will be planning more activity around the exhibition. Dates to follow. This entry was posted in Uncategorized on June 22, 2013 by hoyheritage. Great to get your newsletter and thanks for including my exhibition. I didn’t realise they’d put something in the Orcadian – I think I sent them some info – but I couldn’t find the mention on their website. Is it in the paper edition only? if so, I’ll try to find a copy tomorrow.